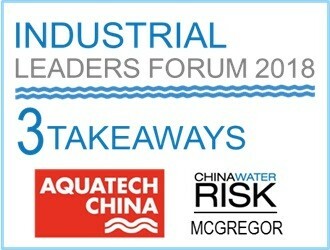 In June this year, China Water Risk was again a supporting organisation and presenter at the Industrial Water Leadership Forum (IWLF) at Aquatech China in Shanghai. Both IWLF and Aquatech China were bigger than ever. Below are our three key takeaways. Meanwhile, see our takeaways from when we went in 2014 here. Aquatech China 2018 was big; held at the National Exhibition and Convention Center in Shanghai, which is one of the world’s largest buildings comprising 1.47 million square meters in total. Simply put, there was a lot to see. The Expo was also more diverse, going beyond its water technology and wastewater focus with additional expo themes including: Flowtech China, Buildex China, Waste Ecotech China & Air Ecotech China. There were also Smart Water pitches at the Imagine H2O booth, where entrepreneurs pitched innovative solutions to China’s water challenges. Clearly the diverse but holistic requirements to tackle pollution are trickling down into industry and trade, which is positive to see. It also shows how the expo has developed from 2014, when we noted the lack of energy/soil/holistic solutions. Also notable at Aquatech China this year was the focus and prominence of “environmental protection” with the words in many posters/signs around the expo and with many companies even having them in their name (see photos below). Trade booths were predominantly local Chinese firms though there were foreign brands, including many of the big names. Walking around the vast and comprehensive expo, it really felt like a new environmental era in China. China’s fast moving regulatory landscape, which we have written about extensively, was the focus at this year’s Industrial Water Leaders Forum. Especially China’s ‘Water Pollution Prevention & Control Law’ (“Water Ten”) (which came into force at the start of the year); “Together we will hear their plans to meet the challenge laid down by the Water Ten” – IWLF website. The first session of the Forum included a deep dive on the Water Ten, “Industrial water outlook under the “water ten rules“, presented by a representative of the Chinese Academy for Environmental Planning. We also touched on the Water Ten and other key regulations in our presentation, which set the scene on China’s changing waterscape. Other presentations, panel sessions and audience Q&A also featured much discussion on regulations. Indeed, China’s new and more stringent environmental regulations are impacting industry (see how for textiles here); businesses want to know what they mean, how to be compliant and where the opportunities are, all of which was discussed at the Forum. Wastewater was another hot topic, specifically how businesses are tackling the stringent standards. One notable remark from the day is that given China’s wastewater permit system, if you can eliminate wastewater (zero liquid discharge) then you are not bound by the permit allowance and so the business can grow. Achieving this requires significant CAPEX to cover the technology, implementation etc. but in the long term it can grow business, highlighting that business unusual models (investment/technology/process etc) are the way forward in China. Further points on the limits and opportunities on wastewater were shared by Nestlé and IKEA. In 2014, we noted in our takeaways that people were split on whether the ‘war on pollution’ is real. In 2018, its clear that the war is real and business know that, as seen by leading companies recognising the risks and opportunities water poses with widespread action. This includes global names like Dell, Nestlé & IKEA, as well as Chinese companies like Sinopec Qilu Petrochemical Water and Wastewater company & Shanghai Electric Power Generation Group, all of which shared their water management successes & challenges. While encouraging, this isn’t surprising given this was the Industrial Water Leaders Forum and so as leaders, expectations are high. Moreover, with companies like Ecolab at the Forum, sharing their solutions to water challenges, it reaffirms that the technology is out there so its down to other aspects of the business model to change (investment, short- v. long-term strategies etc.) in order to make business more sustainable and ensure future growth; essentially developing business unusual. However, the Forum did highlight two key points: 1) while leaders are acting, there is still room for more, and 2) other companies in industries need to step up so that an industry as a whole can move forward; there is only so much leaders can do. Questions from the audience reflected this second point with many asking the companies to present on how they manage water & wastewater, what they are doing in response to the Water Ten and so on. With both IWLF and Aquatech China 2018 bigger than ever and with a more holistic offering, it appears that industry is understanding and reflecting the complex and holistic solutions needed to overcome China’s water challenges.